The measuring system of each axis is mounted on Robax (a thermally inert material) which together with the granite construction, makes the Spark Gage an accurate and fast machine even under temperature variations. 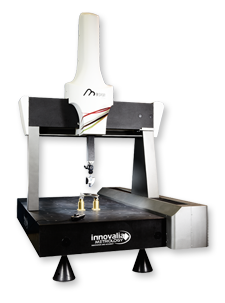 The Spark is ideal for high accuracy measurements, scanning and digitising tasks. Therefore, the Spark finds its application typically in the machining, mould and stamping market. On the new Spark Gage Plus model, residual rotation defects are much lower than on conventional measuring machines with lateral guides. To obtain perfect measurement symmetry, the non deformable granite frame of the gantry moves on the main marble which provides the geometrical reference for the X and Y axes and below the work surface, which is also granite. The work surface supports are placed at the corresponding edges of the machine on the floor, so that it is not possible for heavy workpieces to deform the main marble. At the top, the two granite crossbeams that provide the geometrical references for the Y-axis are perfectly embedded in the two vertical granite columns of the gantry, ensuring that there will be no deformation of the closed frame. Reader tapes stuck to the granite.